Uno over TCP/IP, UOTI for short, is an open source program to play the famous Uno card game over TCP/IP based networks or/and against the computer. 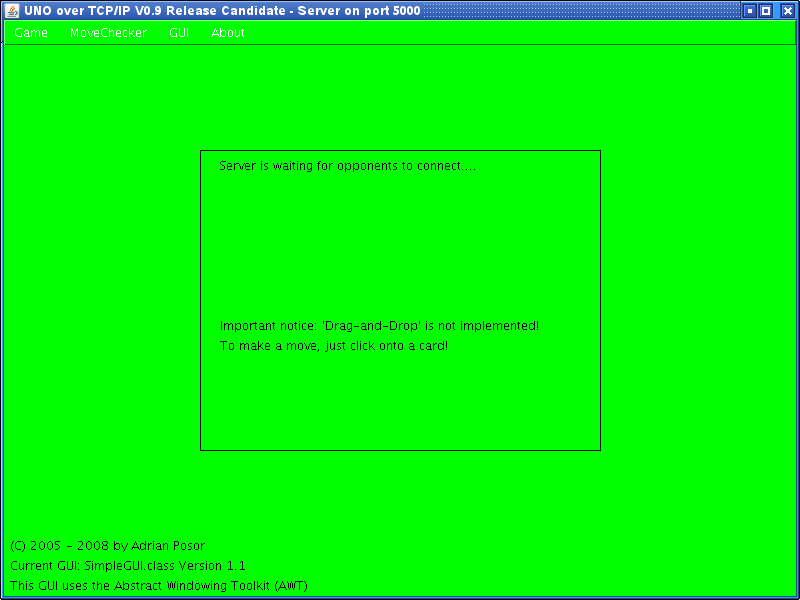 The program has a console which can also be used to chat with the people that are connected to the server. 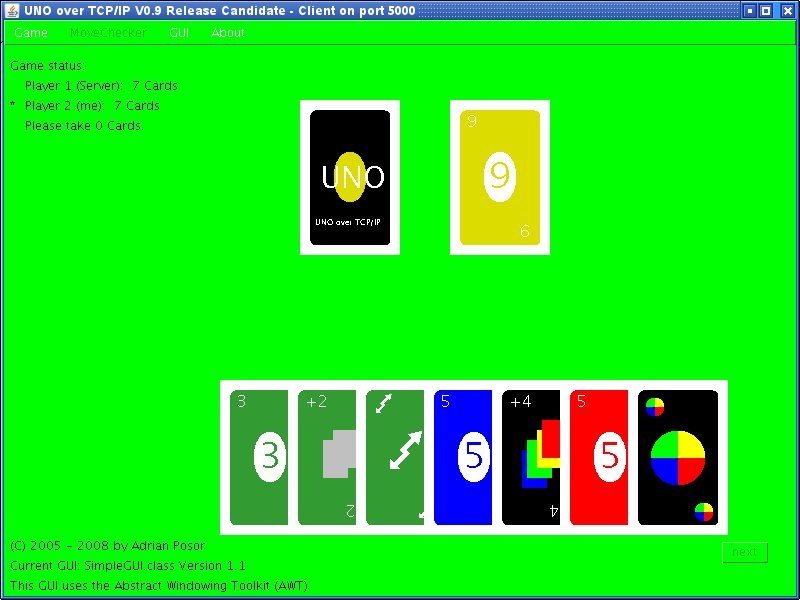 The user can use selfmade card images, which are used to draw the cards on the screen. The card images can be in the tiff or gif file format. If no card images are found, the program draws the cards itself. Please note that "drag and drop" is not implemented! To make a move, just click onto a card. Java 2 Runtime Environment 1.4 or higher. Coming soon: computer player: no human opponents ready? Play against the computer itself! Wild Draw Four and Draw Two can be played followed directly by each other. The number of cards a player has to draw is accumulated. These rules can be disabled in the options window coming in version 0.9.1. If you want to play according to other rules, you can do so by disabling the move checker. This program is free software! Free as in speech, not price. Type 'stc 127.0.0.1 5000' on the same prompt to start a client connecting to 127.0.0.1 on port 5000. Click on a card to to make your move. Add an options menu to the move checker to provide the possibility to select / deselect rules of the game. Write an alternative GUI that supports double buffering for smooth animations. Race Condition: If more than two players are involved in a game, the server may hang while dealing the cards. If a pending player closes the connection, the whole game is aborted. A pending player is a player who joined the server while a game had already been in progress. If a server and a client are running in the same instance of UOTI, then the cards in the player's hand of the server are not taken from the player's hand. The game will work properly if you start a new game. With JRE 6 under Linux, the font color of the menu is white instead of black. This problem does not exist with JRE 1.4.